Sometimes in life, everything depends upon asking the right question. Carmelo Nicotra saw his question dangling in front of him while he went about his daily routine as a wholesale olive merchant at Buccheri, Sicily on Mount Iblei. 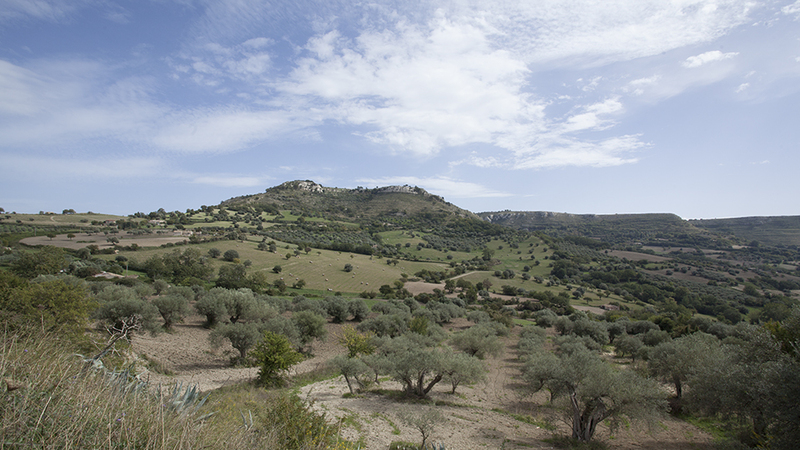 This mountain is home to one of the most prized varieties of olives: the Tonda Iblea. Carmelo reflected on this. His question was so simple that no one had ever asked it before. Why is it that everyone in Sicily knows how to conserve olives at home, but it’s so difficult to find commercial olives of the same high quality? The answer to his question is manifold. First of all, olive oil is the final product that allows the producers to be known, to emerge on the market, and for the quality of olives to be recognized. Other olive-based products are simply opportunities for companies who have already gained visibility with their olive oil to create a joint offer. Second of all, conserving olives requires considerable artisan work behind it. 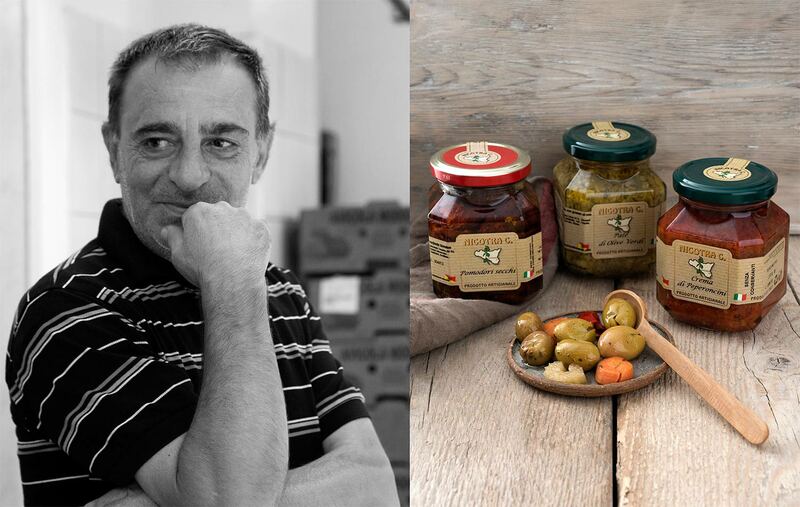 And so, Carmelo Nicotra, who worked in olive wholesale, decided to transform his garage into a workshop in 1983 that over time was endowed with all the HACCP requirements. There, he pitted his olives (first by hand, then by machine), conserved them in brine, and, overall, created artisan olives. After repeated efforts, Nicotra identified the Cocktail Olive. The perfect olive is the Nocellara variety from Mount Etna, which conserves to a perfect, unoxidized green. Olives with imperfections are sold for domestic use, and when your eye falls on a jar of these, they are nonetheless lovely. To conserve black olives, or punciute as they call them in Buccheri, he uses the delicate, abundant Tonda Iblea spiced with wild fennel and orange. Since 1983, year after year Carmelo Nicotra has ventured forth in his own world – no matter that his wife and son continue their own careers without following his olive adventure. He believes in his work and his results support him; he later found it necessary to add two warehouses to his garage. For others, the kind of work Carmelo does is marginal; but for him, it is central. His olive paté is not that crushed mass of olives and pits we are accustomed to tasting, but the pure olive flesh that shows you the difference in its smooth consistency and incredible flavor. And, because one cannot live by olives alone, he explores other conservable ingredients. His hot peperoncino paté practically has therapuetic virtue (we cure our winter sore throats with a spoonful of Nicotra peperoncino; we are empirically persuaded that in addition to a delicious shock to the taste buds, it works very well as an antibacterial for the throat). We all have moments when we can change the course of our lives, but Carmelo Nicotra seems to pluck them prodigiously from the air. Around 2010, he met Andrea Graziano, a future champion of the socio-gastronomical life in Catania. Upon knowing him, Carmelo understood the importance of packaging, the relation between jar form and accessibility of his product. He saw that a large-mouth jar is not just an attractive design, but it’s practical. He understood these rules to the game, and then he changed them – to a degree. He knows that the traditionalist sector of his clients don’t “trust” trendy jars, suspicious that they are all image and no substance. Carmelo knows how to surprise everyone with form and, overall, substance. His olives are processed with love that transmits the territory of Buccheri, of Mount Iblei and the sea, of Syracuse and nearby Ortigia, and they do not disappoint. The best moment is when Carmelo opens his eyes wide in expectation, following your gaze and catching your surprise as you taste his cocktail olives for the first time. Introduce them to your Martini. Carmelo tells us that, after they’re topped with Nicotra olives, Martinis settle for nothing less.